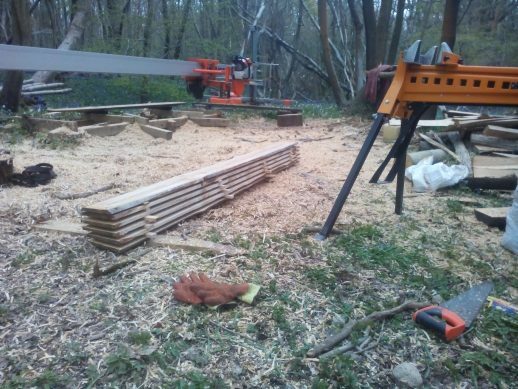 Even where it is possible to bring in heavy equipment, one of the biggest considerations, particularly in small woodlands is the impact that this would make especially to the woodland floor. This method of hauling big trees out, usually to a static sawmill somewhere , seemed to me expensive in terms of equipment and the environmental impact that this equipment makes. 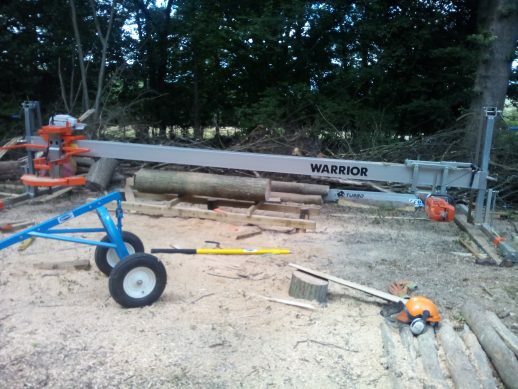 I started looking at different systems, systems which meant turning things around and bringing the sawmill to the tree. 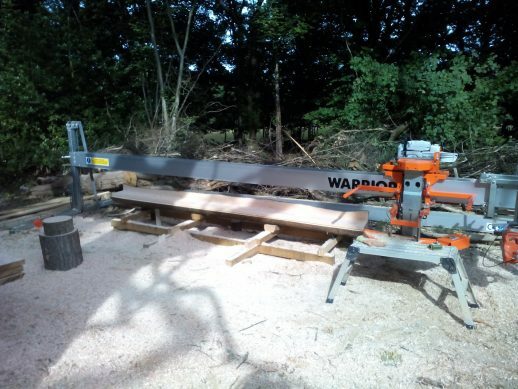 This has lots of advantages especially for the smaller-scale operation in small woods where care and precision is much more of a consideration. 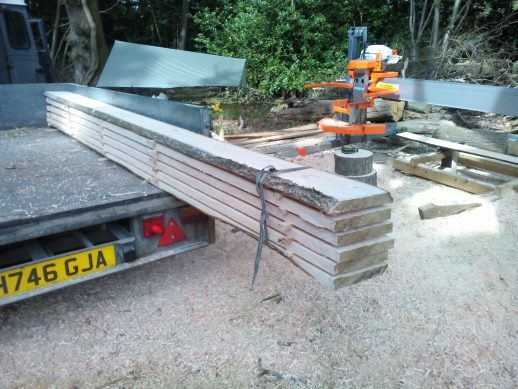 Once you start moving away from a static mill and towards a portable mill, compromises become necessary. Components need to be lighter and easy to dismantle, service and reconfigure. The Turbosaw model I have is a fairly good compromise. The beam which the carriage runs on is 5.6m and made of aluminium, it also has an extension piece of 1.8m. It is light enough for two people to carry, but because it is made of aluminium there is a degree of flex. 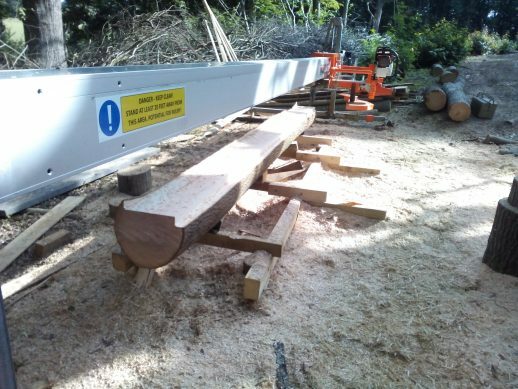 In practice, this is not usually noticed, but it does mean that when the saw carriage is midway along the beam, it can be 1mm or 2mm lower than at the ends … within acceptable tolerances, at least I’ve never needed to, or been asked to mill a piece of wood with greater accuracy than this! The power source which runs the 16″ circular blade on this model is an adapted off the shelf Stihl 120cc chainsaw. The sprocket is replaced with a pulley system connected to a fairly standard car fan belt which runs a driveshaft to the blade. It is very easy to change it back to the original sprocket and guidebar configuration, and this was one of the reasons I went for this system. I like the idea of having more than one use for each bit of kit. The carriage itself is made of steel and though not particularly heavy, again requires two people to manhandle it on to the beam. This is mainly because of it’s awkward size and shape. 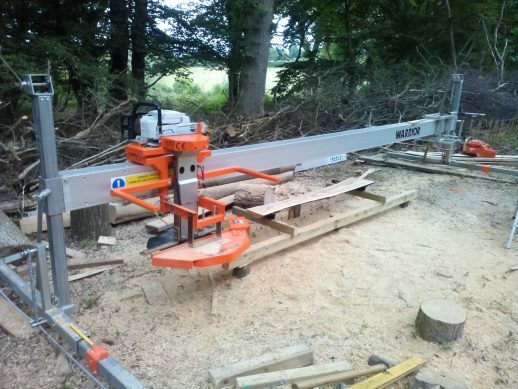 The chainsaw is easily bolted on and connected to the fan belt after the carriage is mounted. If you’ve used a chainsaw to rip boards either freehand or with a jig like the Alaskan Mill or Logosol systems, you’ll know how important it is to keep the chain tip-top sharp and also how quickly it can dull. This is a big time consideration with these systems. Sharpening the circular blade in comparison is a doddle. There are only 4 tungsten teeth on the blade and these are easily sharpened with a 12v grinder connected to your vehicle or if you’re not able to get close enough, I guess carrying a battery to the mill would be the easiest solution. Fan belts are easily changed and you should keep a couple of spares. Apart from that, check all the bolts and fixings for tightness on each use, grease and lube the moving parts and you’re away. This system will handle anything from 6″ or so in diameter to large 30 or 40″ plus butts. 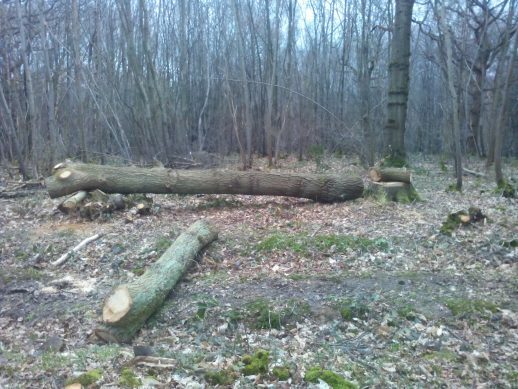 Usually the smaller lighter logs can be moved to the mill. 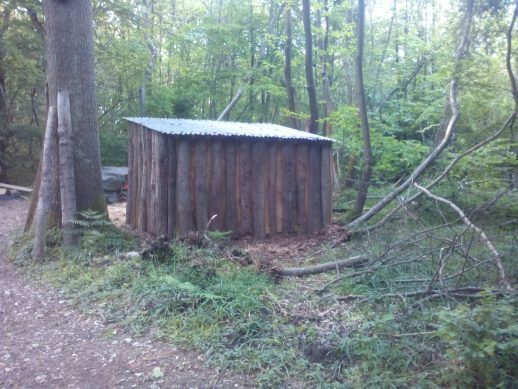 I use a Logrite logging arch for this. The ‘junior’ model will handle anything up to 16″. But somewhere along the line you will come to point where you decide that it is easier to move the mill than the log. 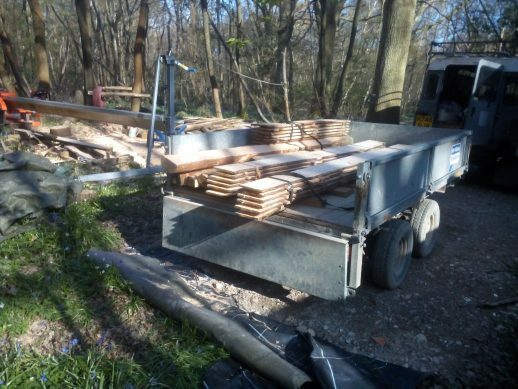 This decision becomes easier to make the longer you have had the mill and the more oversized logs you have attempted to move! Don’t try moving anything that will damage you! It’s far better and safer to move the mill! Having said that you can make things easier for yourself and try to set up the mill at the lowest point possible, this will put gravity on your side and gravity is fairly relentless and doesn’t tire so easily. With the bigger trees, obviously you will need to build the mill around the tree. 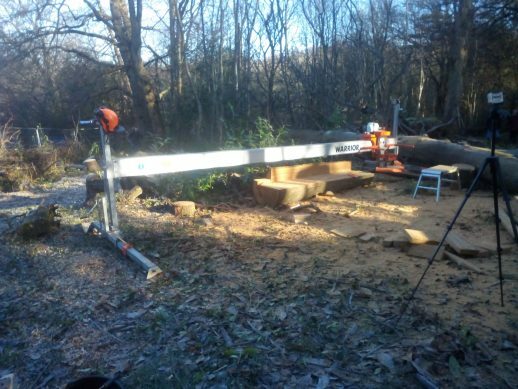 Even then you will have limitations, milling an 8″ x 8″ post or beam anything more than 2 or 3m long is still going to require some kind of mechanical extraction or if you’re lucky gravity to get it to your extraction route. 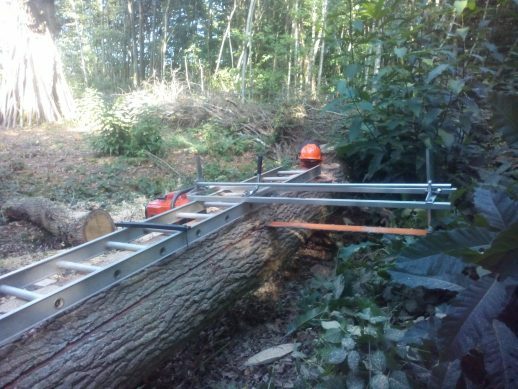 The swinging arm is the greatest asset of this system, horizontal cuts are made by pushing the carriage forward it then swings 90 degrees and you pull back to cut vertically. The 16″ blade means in practice it can handle cuts up to 8″ and produce lumber of any dimension up to this limit. 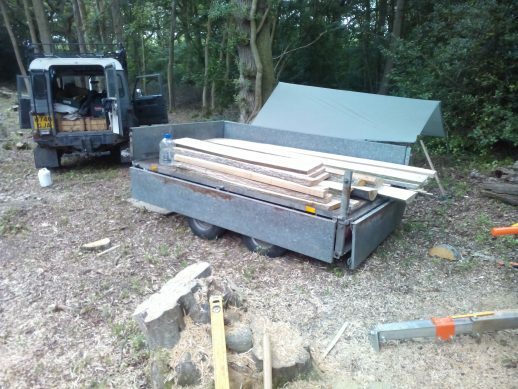 There is a way of extending this using a double cut method or turning the wood over. 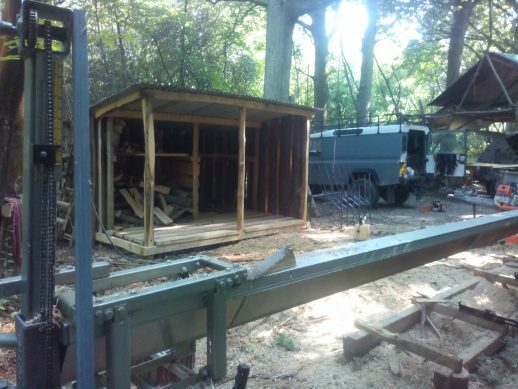 However, as I have quite lot of large diameter oak, I have added an Alaskan Mill cradle running another chainsaw and ripping chain to the same beam. 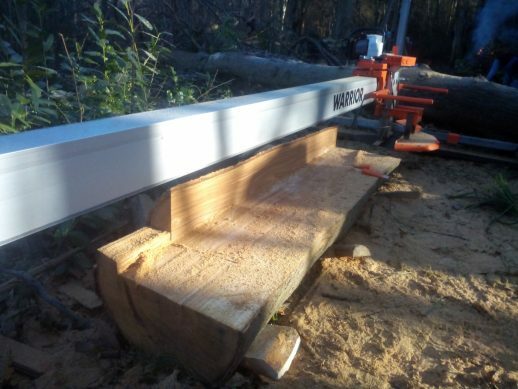 This means I can mill squared-off lumber with the swinging arm then when I reach the middle of the log, where the wood is most stable, I change over to the Alaskan Mill and can cut wide slabs for table tops or other products that need oversized boards. Just over two years after buying the machine, I’m very pleased with how it has performed, though I am continually thinking of ways to improve it. 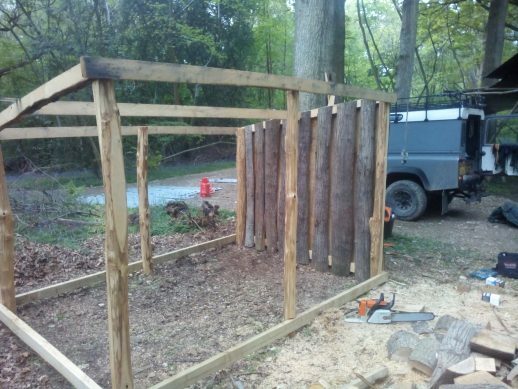 Currently I’m trying to adapt the logging arch to carry the carriage and the beam. 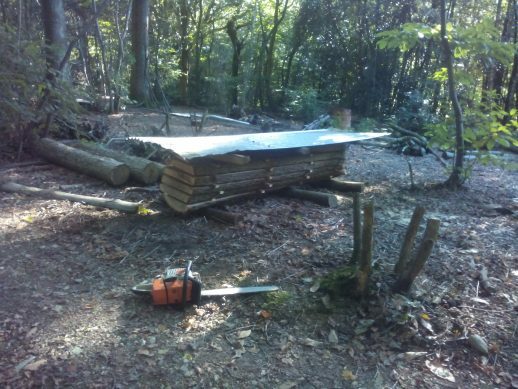 I understand its limitations but as part of an overall woodland management system I think it opens up many more possibilities for harvesting valuable but difficult to get at timber as well as a method for improving the health and viability of the woodland with the least amount of disturbance and impact to the wood. To find out more, follow the links below.